What do a tall, blond German from Düsseldorf, a petite Guamanian (from Guam) and an East Village-born-and-bred Puerto Rican have in common? Salsa, of course. Daniel Enskat, Ahtoy Wonpat-Borja, and Joseph Rivera are the unlikely founding partners of the three-year-old Baila Society, or BASo, which is housed in Chelsea Studios, 151 West 26th Street, 6th floor. They all met at Santo Rico, a world-class New York-based salsa studio, but had a different vision of how to teach salsa. "Salsa is mainly a street dance," explained Wonpat-Borja, 28, who had twenty years of ballet training before she switched to Latin ballroom competition in college and then to salsa. "It's very creative, and people put a lot of themselves into it. But if you go to two different classes, there will be two completely different ways of dancing. We wanted to make it more methodical, structured and effective." The partners focus on foundation and the common features that all styles of salsa have – though they teach New York salsa which breaks on two – "so everyone can learn and enjoy it, not just professional dancers, or growing up with it, or having danced it in the kitchen with their moms," Wonpat-Borja added. Their passion for salsa reaches a global audience through their varied mix of programs and projects. 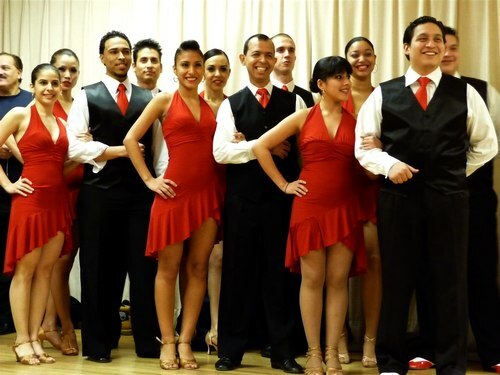 Their popular website, BailaSociety.com, teaches people from forty-seven countries via new monthly videos from basic to advanced lessons, Santo Rico classes and a research library which links to music theory, dance theory, Latin music, history and culture overall. Enskat, 34, merged his business savvy (he is a partner in a consulting firm) and personal experience (he was stressed out from working 18 hours a day) to reach yet another audience. "I wanted to keep the feeling and passion of the culture and introduce it to people like stressed-out doctors and financiers, who would appreciate this art and benefit from the sophistication it has to offer," he said. Thus, BASo organizes high-end overseas salsa vacations, which takes students to such diverse places as France, Dubai, Italy, Switzerland and Tokyo. "There is a subculture of salsa everywhere in the world, not only in Latin countries," said Enskat. Their live studio classes include partnerwork, performance technique, footwork, styling, spinning, body movement and stretching and basics. Enskat teaches the men's individual class and Wonpat-Borja teaches the women's. They have also established a repertory company with a core of sixteen dancers who train six days a week with Enskat and Wonpat-Borja. When they travel, which is often, they teach and the company performs. In October, they went to China to judge a salsa competition and stayed for two weeks to give workshops to the salsa teachers there. In the fall they will debut a one-and-a-half hour theatrical production in New York and China that highlights the history and art of New York salsa. They are currently focusing on Asia because the salsa scene is growing quickly. "It's fairly new, and we want to be part of that growth," said Wonpat-Borja. Because they have had so many applications for their company, they started a performance class. On January 22, the class made its debut and wowed an enthusiastic audience of salsa students, friends and aficionados, who had their own chance to shine at the lively dance party before and after the show. The dancers in training, divided into an appropriately attired red and blue group, were partnered with seasoned company members, but there was no way of distinguishing between student and professional. Rivera and Zakiyya A-Wali, the most senior members of the company, choreographed the student dance number, which both groups performed, while Enskat and Wonpat-Borja created the company's dance which preceded. "I gave Joe and Zak the music, which I slowed down 50%, and the counts so they could get their feet wet," said Enskat. "It was the first student performance we did. We want all the repertory dancers to have a chance to become creative." Rivera, 30, said it was a challenge, but acknowledged it was also a collaboration. "All the performers pitched in," he said. Cesar Roman, one of the student dancers, was very excited about the opportunity to perform. "We worked very hard over eight weeks, and everyone put in a lot of effort," he said. "I liked the choreography and the sophistication of their style."